This dessert is surprisingly flavorful and delightful. It is adapted from Alicia Siverstone's book, The Kind Diet. Heat a dry skillet over medium heat. Add the almonds, and toast for 3-5 minutes, stirring constantly, until fragrant and golden brown. Transfer to a small bowl or plate to cool. When cool, buzz the almonds in a grinder, food processor or blender until very finely ground. Heat the rice syrup in a small saucepan. Add the ground almonds, and stir over medium low heat until the mixture thickens. Set aside and try not to eat it all up! Arrange the pears in a deep skillet, cut sides up. Add the pear or apple juice to the pan along with the ginger juice and salt. Cover the pan, bring to a boil, then reduce the heat to medium, and simmer for 7-10 minutes, or until the pear halves are soft. Using a slotted spoon, transfer the pears to a serving platter, reserving the cooking liquid. Mix the lemon juice and zest into the reserved cooking liquid. 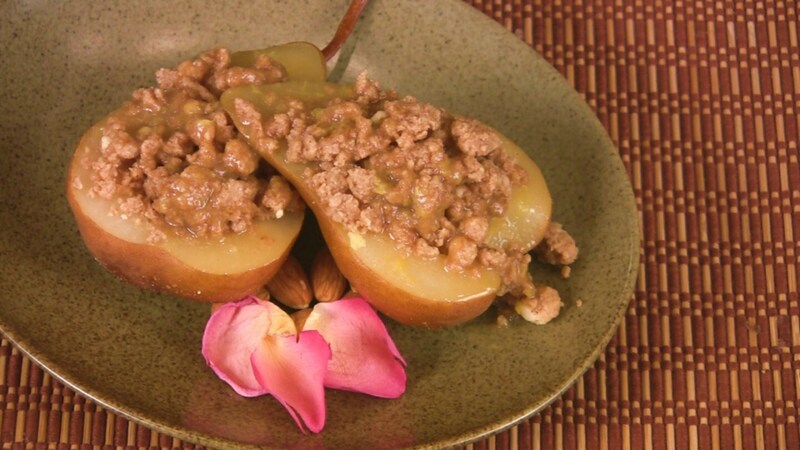 Fill the hollow of each pear with some of the ground almond mixture. Pour the sauce over the pears and serve. If you prefer extra sweetness and some more color, drizzle each pear with 1 teaspoon of the optional maple syrup. Tip: After grating the ginger, use a garlic press to squeeze all of the juice out. Make It Yours! Use spiced apple cider or cherry juice in place of the pear or apple juice. For a thicker sauce add 1 teaspoon of kuzu to the reserved cooking liquid. Almond meal could be used in place of the 1 cup of almonds, but it won't have the toasted flavor.